Because of the importance of what it regulates, the FDA comes under tremendous political, industry, and consumer pressure. But the pressure goes far beyond the ordinary lobbying of Washington trade groups. Its mandate-one quarter of the national economy-brings the FDA into the middle of some of the most important and contentious issues of modern society. 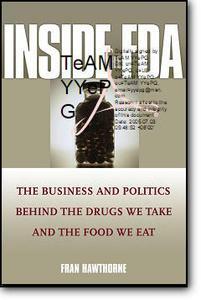 From "designer" babies and abortion to the price of prescription drugs and the role of government itself, Inside the FDA takes readers on an intriguing journey into the world of today's most powerful consumer agency. In a time when companies continue to accuse the FDA of nitpicking and needlessly delaying needed new drugs, and consumers are convinced that the agency bends to industry pressure by rushing unsafe drugs to market, Inside the FDA digs deep to reveal the truth. Through scores of interviews and real-world stories, Hawthorne also shows how and why the agency makes some of its most controversial decisions as well as how its recent reaction to certain issues-including the revolutionary cancer drug Erbitux, stem cell research, and bioengineering of food-may jeopardize its ability to keep up with future scientific developments. Inside the FDA takes a closer look at the practices, people, and politics of this crucial watchdog in light of the competing pressures and trends of modern society, revealing what the FDA is supposed to do, what it actually does-and fails to do-who it influences, and how it could better fulfill its mandate. The decisions that the FDA makes are literally life and death. Inside the FDA provides a sophisticated account of how this vitally important agency struggles to balance bureaucracy and politics with its overriding mission to promote the country's health. Fran Hawthorne (New York, NY) is a senior contributing editor of Institutional Investor and has connections deep within the business and finance communities. Hawthorne has been covering healthcare and business for more than twenty years for such publications as Fortune, BusinessWeek, and Crain's New York Business. She is the author of The Merck Druggernaut (cloth: 0-471-22878-8; paper: 0-471-67906-2).